Spring is most certainly in the air around Moscow, meaning extreme athletes, such as Russia's national skydiving team, can now indulge themselves with the sports they love. ­Team Russia have been training hard in preparation for the World Cup that takes place this July in Germany. After that stage, the team will have time for further training and any necessary adjustments ahead of the top aerial competition – the world championship. Two-time champions Russia are one of the leaders in this sport, but that does not mean it is going to be a walk in the park. “The French and the Americans jump on a regular basis and are worthy rivals. The World Cup will show what's to be expected from each team – from the French, the Americans, and Russia – or maybe there is some other team that has pulled up its socks and can prove a worthy rival,” said Sergey Shenin, a member of Team Russia. Formation skydiving is not for everyone, but they say that once you try it, it is practically impossible to stop. 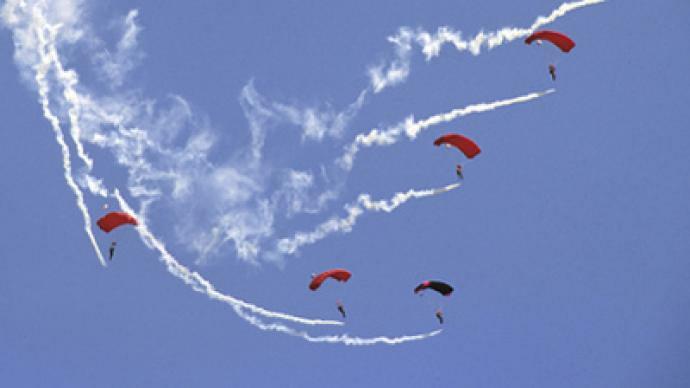 Simply jumping from a plane into the open sky is not enough for professional parachutists. And chasing records has become a lifestyle for most, while a release of adrenaline has become a fun necessity. Leonid Kazinets is one of the members of the Russian sector of that 400-way formation world record. He is also an integral part of the national team preparing for the next World Cup in Germany. The wind tunnel or a freefall simulator is where Leonid and other skydivers perfect their formation skills. Unfortunately, these artificial conditions have to be used often, because Moscow's unpredictable weather doesn't allow for year-round skydiving. However, so far it hasn't kept the Russian crew from international success. “We are professionals. We like to win. We like to be proud of ourselves, our team, our club and our country,” he said. Formation skydiving is an acquired skill that takes years to perfect. An athlete in peak form is usually between 30 and 40 years of age, but for many the dream starts with the first tandem jump guided by an instructor.